Michael Ballack will go down as one of the greats of German football, leaving behind some unforgettable memories for both club and country. Only a personality and player of his standing could have dominated the news agenda - and not just the back pages - on account of an ankle ligament injury, as happened little over a month prior to the 2010 FIFA World Cup finals. Playing for Chelsea FC at the time, Ballack had successfully led his country through qualification, before a foul by Portsmouth's Kevin-Prince Boateng in the English FA Cup final ruled him out of the tournament in South Africa. As it transpired, the likes of Mesut Özil and stepped up to the mark to herald in a new era for the national team, took over the captain’s armband and, a year later, the international career of one of Germany’s true leaders was over. Ballack subsequently rejected the offer of an international farewell game against Brazil, although he has since arranged a testimonial on 5 June in Leipzig, where he will be joined by a host of stars including and Jose Mourinho. There is no question that he has earned the honour. It all began back in his native Chemnitz. 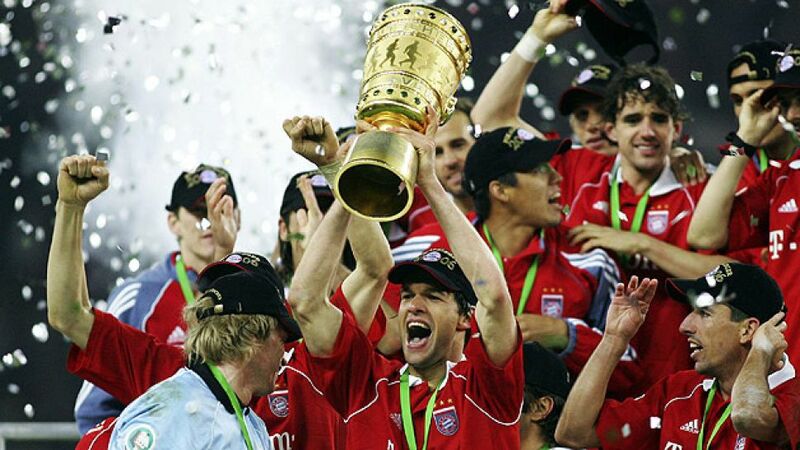 After starting out as a professional at his hometown club in Bundesliga 2, Ballack climbed the first rung on the ladder to greatness, moving to Otto Rehhagel’s newly-promoted 1. FC Kaiserslautern. In his first season at Germany’s top table, he would get his hands on the league title - to this day the biggest shock in the division’s illustrious, 50-year history - gaining the attention of a number of other Bundesliga outfits before opting for a move to Bayer 04 Leverkusen in 1999. The next logical step in the midfielder’s burgeoning career was a call-up to the national side. Soon installed as captain under former Bayer coach Rudi Völler, Ballack was the linchpin of the Germany team that surprised many with a run to the final of the 2002 World Cup in Japan and South Korea. He scored three goals and laid on four along the way, only to miss the final - a 2-0 defeat to Brazil - through suspension. Just prior to those finals, the powerful playmaker with an eye for goal had been a three-time runner-up with Leverkusen to Borussia Dortmund in the Bundesliga, FC Schalke 04 in the DFB Cup, and Real Madrid in the UEFA Champions League. But success followed his move to FC Bayern Munich, where he thrice won the league and cup double. A rousing display at the 2006 World Cup that saw Ballack lead his team to a third-place finish on home soil earned him a high-profile move to the English Premier League and Chelsea. Another league title and three FA Cups ensued, but his fortunes did not pick up in the UEFA Champions League, with the Blues falling at the final hurdle, on penalties, to Manchester United in 2008. That same year, Ballack had the opportunity to put that trail of disappointments behind him at the European Championships in what turned out to be his major tournament swansong. Once once again, though, his hopes were dashed, with Spain striker Fernando Torres' goal deciding the final in Vienna. The heartache of missing out on international gold and the 2010 World Cup behind him, Ballack, with 42 goals in 98 international appearances to his name, made old flame Leverkusen his final station on a 17-year rollercoaster ride. While injuries often reduced the one-time poster boy of German football to the role of bit-part player during his two-year stint at the club, his final appearance against 1. FC Nuremberg in May 2012 was nevertheless greeted with a rousing mix of gratitude, adulation and sadness, befitting the stellar career of one of the game’s true legends.